If ever there was a star just made for navigation, it is Polaris, otherwise known as the North Star. Located in the north, it is by far the most useful star for someone trying to find his way here in the earth's northern hemisphere. around the Celestial North Pole. 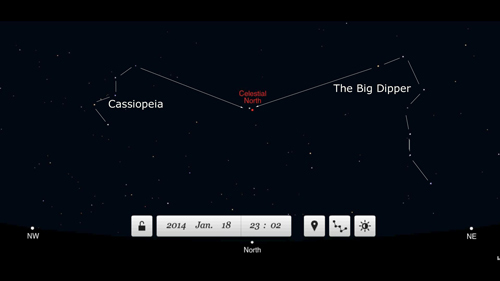 One really cool thing about this star is that its angular height in the sky pretty much equals your latitude. I say "pretty much" because while the North Star is not located exactly at the sky's pole, it is less than one degree from it. Even though it appears fixed to the naked eye, it actually goes around the pole in a tiny, tight circle. There are times in its tiny path around the pole when its height exactly equals your latitude, and other times when it doesn't. No worries, you couldn't tell the difference in Polaris's height unless you had a sextant or other precision instrument. To the naked eye, Polaris appears firmly fixed dead in the north sky, and as far as we're concerned here, that's where it is and its height equals your latitude. At your location, if Polaris is 30 degrees above the horizon, your latitude is right at 30 degrees North. The farther North you go, the higher Polaris is in the sky. I live in Florida near latitude 30 degrees North, and am accustomed to seeing this familiar star at that altitude. I remember studying the night stars once while in Nova Scotia, and saw that Polaris was much higher in the sky. If I had just crash landed at my location, and had no idea where on earth I was, just the height of Polaris would have let me know I was far to the north of Florida. Since Polaris is located due north, we can use it as a convenient guide to find any direction we want. If you know one direction, you know them all. While facing Polaris, east is off your right shoulder, west is off your left shoulder, and south is behind you. Use your hand as a protractor to measure degrees of arc along the horizon in 15-degree increments. If you don't know how to do this, you'll find an explanation on my page labeled direction finding. Given the importance of Polaris for navigators, any constellation that can help us locate it in the night sky is a very useful star grouping. Fortunately, there are several star groupings that can do just that. Oh, and one other important thought--you don't actually have to see Polaris to find north. Perhaps your night sky is partially cloudy, or maybe tall trees block your view. No problem. To know which way is north, you need only determine by some reliable means where Polaris is, regardless of whether or not you can actually see it. Once you've determined Polaris's location--whether or not it is actually visible--simply draw a line in your mind's eye from that location straight down to the horizon. Where that imaginary line intersects the horizon is true north.